The recently released design for the Seneca Buffalo Creek Casino struck me as a big middle finger to every person who has spent the better half of a decade trying to hold up and halt the progress of the downtown casino. The release of the design came out just ahead of the official announcement of the RFP for the Webster Block – one of the pivotal lots in and Canalside and the First Niagara Center. According to reports, the plan for the Webster Block will come out in June with the possibility of construction on a new project to coincide with that of the Donovan Building and the casino just a few blocks away. Construction on the casino is supposed to be complete in 2013, but we will see how many lawsuits are filed in hopes of stalling the project. 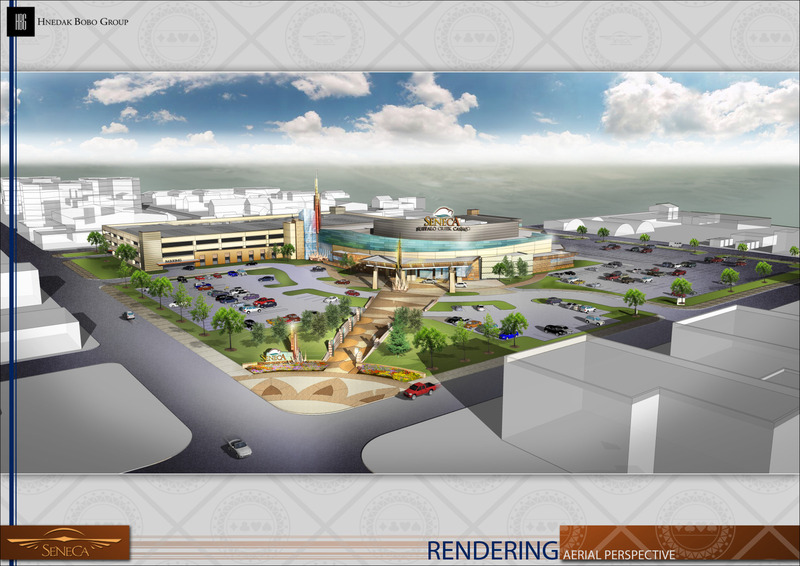 One of the ideas behind the scaled-back casino project was to allow the surrounding neighborhood(s) to prosper from those patronizing the establishment. In theory, it is a good approach to take; allowing casino-goers certain services from the nearby restaurants and FNC will keep people moving throughout the area, rather than confining them to the casino. This is the type of thinking I can get behind. If I’m being truthful, I don’t love the redesigned casino. The entire project is nothing more than a nice looking building buried in a sea of parking lots. I understand the need for parking – it is something that has been lost on many – but it would seem as if the assembly of lots may be more of an antagonistic piece of design. I can’t say I blame the Seneca’s for such action, regardless of the actual intent. This project was once a giant hotel and casino project complete with a performance hall. It may have been expected to act as a silver bullet for the city, which was an incorrect designation. However, the hotel tower and gaming hall would have brought a serious attraction just steps away from FNC. However, numerous lawsuits and the claim of a dipping economy held up the project and eventually led to the pathetic embarrassment that has graced the corner of the lot since 2008. Now the casino will be nothing more than a complimentary piece of the puzzle, rather than a major part of the big picture approach to a district starving for development. The reason I offer such an opinion on the casino itself is that the potential project to be built on the Webster Block could have some relationship to some of the ancillary amenities offered to casino patrons. The Webster Block project will undoubtedly have an impact and ties to the development of Canalside. At least it should. Bryon Brown indicated that there won’t be any thumb twiddling with regard to the Webster Block project, saying that the RFP date is a hard deadline and they he hopes for construction to begin by next spring. Hopefully that hard line approach is maintained and keeps any obstruction from halting the potential construction of the project. Of course, the accepted project also needs to bring more to the key parcel than just a parking lot. The Buffalo News mentioned that the Sabres, Carl Paladino and Buffalo Civic Auto Ramps expressed interest in the property. If the city awards the property for a parking ramp to be built, it will be one of the most backwards decisions made in Buffalo for sometime. There are plenty of appropriate spaces for a ramp to serve FNC and Canalside; the Webster Block is not one of those places. I’d be worried about Paladino’s intent as well, given the progress made on the Fairmont Creamery and Greystone properties. Regardless, a quick build on a forward thinking project is necessary. More parking spots are not the answer. Personally, I’m rooting for a Sabres-led mixed-use approach. I’d love to see a practice facility with the capacity to hold games for the Junior Sabres and Canisius College to be built with additional space provided for retail, restaurants and potentially even offices or residences. Maybe that is a bit of a pipe dream, but a legitimate piece of property should be the goal here. I’d like to see something new added to the skyline (think mid-rise, not high-rise) that will compliment the Donovan rehab going on across the street. Think of it this way; the southern view off the 190 could change from a ghastly Donovan Building to a dense pocket of buildings. Hopefully there are some winning ideas put forth by those submitting RFPs. However, the onus lies with the City. The winning project needs to be the best project for progress; I doubt very much that any sort of parking garage will do the trick. Development down near the water is slowly reaching critical mass, the Webster Block project needs to keep that momentum rolling.